Barbara explains so well how to combine the two stencils you can see it here: http://barbaragrayblog.blogspot.co.uk/2014/02/time-and-tide-wait-for-no-man.html the instructions are very clear ... pictures & words it is simpler than you might think if you follow step by step. Having made the background I wondered what to do with it so I set to with Clarity's shell stamps and got lost in some colouring in. 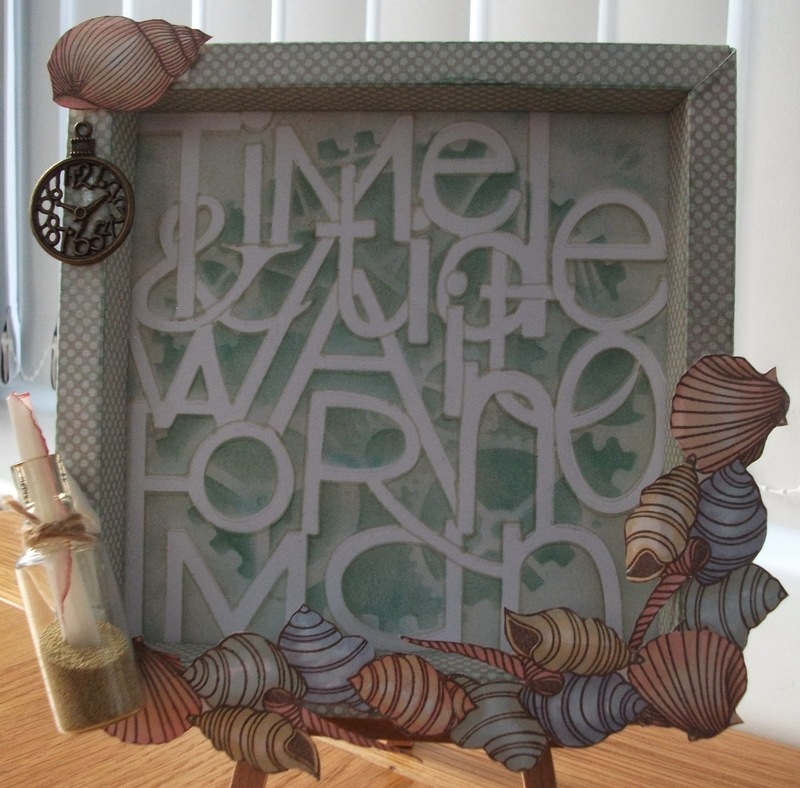 I had some box frames in my crafty stash so I mounted what i had made into the frame and added a clock and a message in a bottle. This sentiment is so apt for the Winter we are having at the moment.... Here in Wales we have had the worst winds ever .. and believe me we have plenty of wind here .... but my thoughts are with the people further South of the UK especially those in Somerset who have endured floods for over 6 weeks now ... I can only imagine how they must be feeling and coping hopefully the end will soon be in sight.They are in my thoughts and prayers. Well Annie first I will address the weather as it's best to get the BAD out of the way first!!! For whatever reason this year's weather has taken a toll in so many countries and YES our hearts must go out to those who have it so much worse then we do!!! Now for the GOOD...what a FANTASTIC creation you have here Annie!!! All the LOVELY elements...combined for a GORGEOUS piece of art here!!! Have a wonderful week Annie!!! !